Developing an adsorbent to mitigate carbon dioxide without large energy penalty is highly desired. 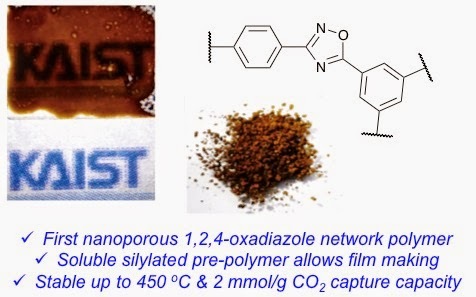 Here, we present a silylation synthetic route to form a processable and otherwise impossible porous 1,2,4-oxadiazole network, which achieves 2 mmol/g of CO2 capacity owing to nitrogen-rich structure. This network shows high CO2/N2-selectivity, thermal stability up to 450 oC, and low-heat of adsorption (26.4 kJ/mol), facilitating easy regeneration.